Critical legal scholars have made us aware that law is made up not only of rules but also of language. But who speaks the language of law? And can one lawfully speak in one’s voice? For the Italian philosopher Adriana Cavarero, to answer these questions we must not separate who is speaking from the very act of speaking; moreover, we must recuperate the material singularity and relationality of the mouth that speaks. 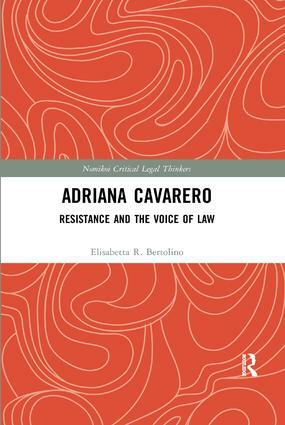 Drawing on Cavarero’s work, this book focuses on the potentiality of the voice for resisting law’s sovereign structures. For Cavarero, it is the voice that expresses one’s living and unrepeatable singularity in a way that cannot be subsumed by the universalities and standards of law. The voice is essentially a material and singular passage of air and vibration that necessarily reveals one’s uniqueness in relationality. Speaking discloses this uniqueness, and so one’s vulnerability. It therefore leads to possibilities of resistance that, here, bring a fresh approach to longstanding legal theoretical concerns with singularity, ethics and justice. Elisabetta R. Bertolino has completed a doctorate in law and legal theory at Birkbeck Law School in London, UK, where she has also taught seminars in jurisprudence and criminal law. Currently, she teaches legal subjects at the University of Palermo, Italy. She has been interested in the theme of the voice and the work of Adriana Cavarero for several years, and conducted an interview with the Italian philosopher which was published in differences: A Journal of Feminist Cultural Studies in 2008.